Hi guy's I doubt that you will remember, I started a couple of Scratch Builds a few months ago. Well the first one is finally finished....yes a few months ago! (Only because I had to wait for parts!) The actual build itself would only take a day or two. Anyway somewhere along the line someone told me that the Australian Air Force never flew F16's. Well I thought it was up to me to change that so the first of my builds was obviously going to be an F16. As this was my first attempt at building a plane out of foam the F16 on this page was really appealing. (Suggest you have a look if you are interested in 3D foamies). So after printing the design I thought the easiest way to join the pages together was by sticking them on a window with the light coming from behind and over lapping the pages to ensure I matched the lines up correctly. Cut the shapes out and position them on a 1000mm x 700mm sheet of Depron. I just held them in place while I traced them out with a pencil but I know some people choose to stick the templates to the foam. I had no problems at all just holding them and didn't have to separate the paper and foam later. I decided that since I had a long wait I would paint the plane while it was still in pieces, the only joint in place at this point is the two main wing. I used Tamiya model paints to colour the foam. I used a airbrush to do the painting but for anyone that doesn't have a compressor and brush set I would suggest water based spray paint cans. 1. Cut out a thin channel across the bottom of the main wings and glue a 2mm carbon fibre rod in place, then tape across the entire length with extreme tape. 2. Glue the two walls of the underside to the bottom of the main wings to create the basic under belly. 3. Glue the lower tail piece and centre wall of the undercarriage in place. 4. Glue the nose and tail wing into place which then finishes the overall shape of the plane. I was really impressed with how well the pieces fit together. 5. Cut a line into the base plate from side to side, approx' half way along the plate and use extreme tape to create a hinge in the same fashion as creating ailerons or elevators. Once you glue the base plate in place the hatch will then form the access door to all the electronics. Use a wooden skewer to pierce the sides and the centre walls under the base plate, pushing the skewer into place. Use a single strong, or a number of normal rubber bands to lock the hatch in place protecting the electronics. 6. Using a piece of plywood found in a local industrial bin, I drew and cut out a @2” circle and shaped and cut as needed to make a motor mount. A template for the mount is in the plans. 7. You will find 2 small wedges of foam in similar shape to a house??? with a long channel from top to bottom. These two items are then glued in place behind the mount to help secure it. Be sure to try the motor mount to ensure it fit before glueing. Also be sure to screw the motor onto the mount BEFORE you glue the mount in place. I also used a large drill bit to drill out the centre of the mount, which I think will help with air flow to the back of the motor. I know this is not a main issue (may not even make any difference) but I thought it was worth while anyway! 8. The last part of foam work is the elevons. You will see that I put them on early in the piece but I would strongly recommend you leave them as late in the build as possible. They seemed to always be in the way while I was working on this plane. Once again a steel rule and a sharp knife was used to angle the joining edges to the plane. NOTE: Make the cuts on the bottom surface to save seeing them from the top. 9. Once they are secure and working as you want, you can glue the horns in place. NOTE: Before you do glue the horns place your servos in position you want and use a straight edge to work out where you want to glue the horns on. The idea is to ensure the push rods are able to work in a straight line. It will look much better if the rods are nice and straight and even! 10. Servos! I will leave the selection to you as everyone seems to have their own favourites, but I will list what I used at the end of the article. TIP: One little idea I use is to cover the servo with tape before glueing them to the plane, be as particular or sloppy as you like, but you will be grateful you did cover them if you crash the plane and want to re-use the servos. The tape prevents the glue contacting the servo body thus making it easy and clean to recycle them. I also used horn connectors on this build but that's up to you, I just thought I would spoil myself!? As I have mentioned a number of times this was my first scratch build and my first attempt at the electronics side of things as well. In with my parts that arrived this week was also one of the Turnigy 9x transmitters. So I had to get my head around that at the same time as working on everything else, so it's just as well as I have a lot of time on my hands! Some of the instructions sounded more like I was to perform brain surgery than control a plane! I decided that for my first build I would go with the same kind of spec's as Boxermad84 listed on his page with only 1 or 2 minor additions/alterations. 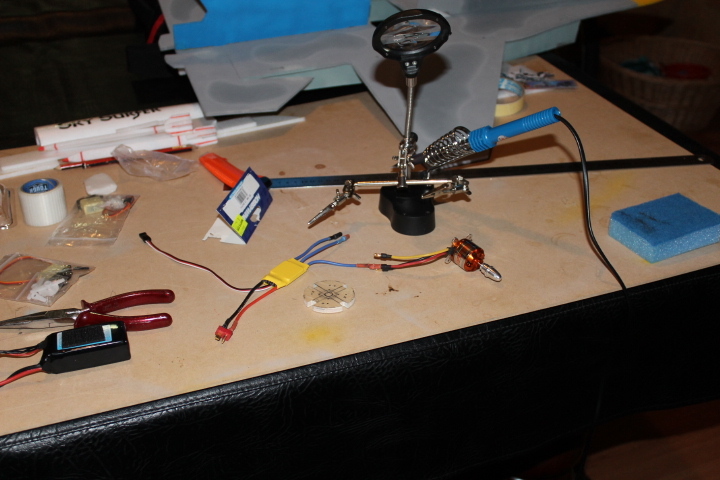 After soldering a couple of plugs I set things out in order to TRY and keep some control of the CG. I managed to get the final CG equal to the motor mount, which I think is probably as close to where it should be as possible. I was really pleased with this result. In order to keep the servos right down the back with very short push rods, I had to use extension cables to reach the receiver. Obviously this was going to cause grief with cables hitting the prop. So to alleviate the problem I visited the local deli and pinched a simple drinking straw. I cut it in half and then ran the knife along the sides to open the two pieces. 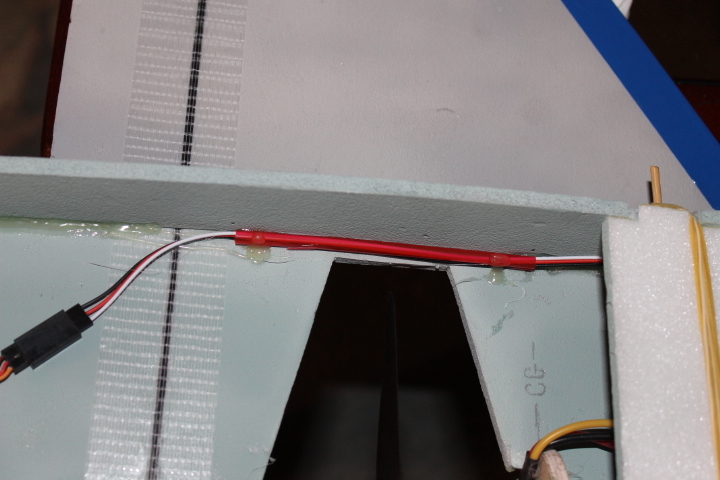 I ran a bead of glue along the walls of the plane, beside the prop and placed the straws in the grooves before feeding the cables into them and sealing them with another dab of glue. Thus keeping the cables tight against the wall but not glugged up with glue. 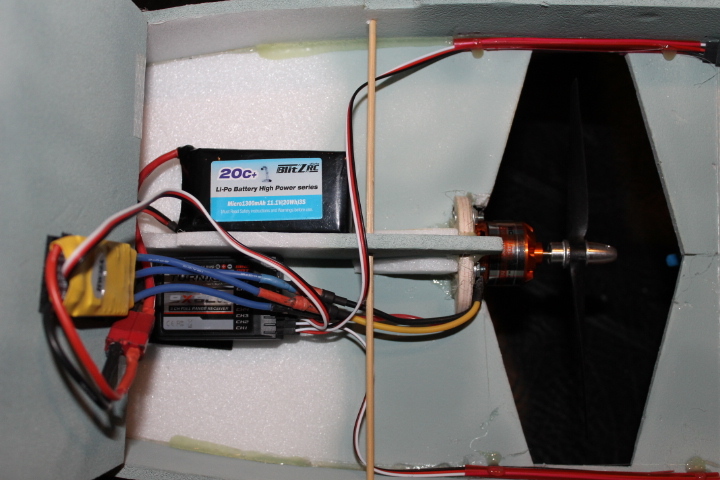 Once I moved everything into position I was able to secure the CG right in line with the motor mount. 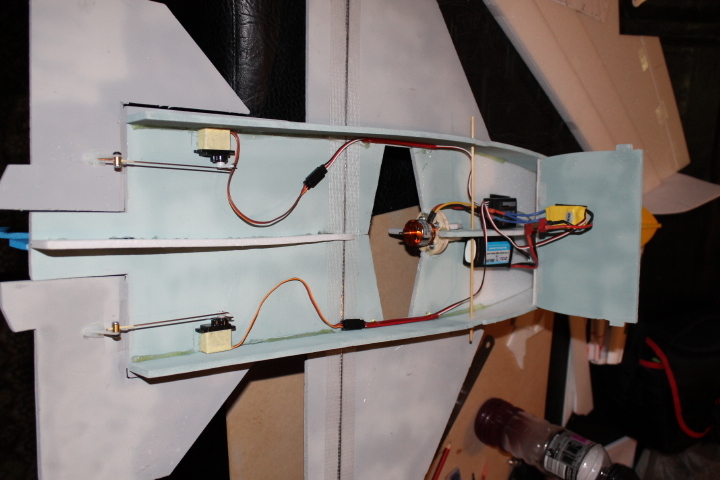 So there you go, finally the build is finished and now ready for the test flight. Oh and for good measure I added a couple of skid plates to the bottom....Just in case I found some concrete to argue with during a landing! 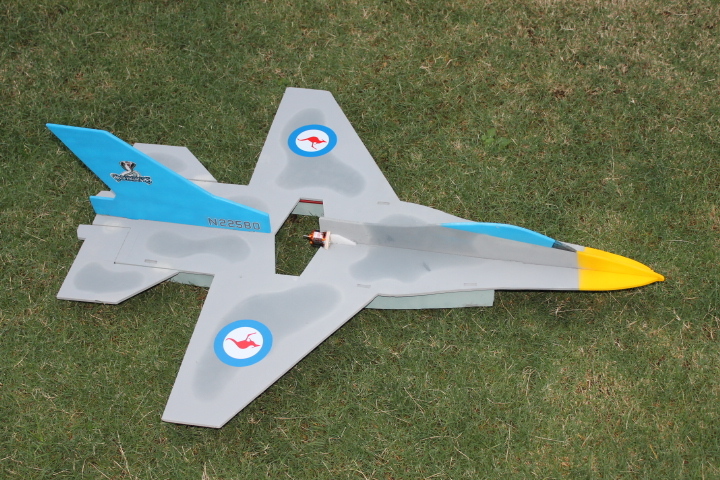 Oh and by the way I lied, the RAAF didn't really use F-16s!